After our stop at Holland Falls we continued on to the west side of Glacier National Park. Unfortunately, since it was so early in the season (in June, even) the snow was still covering many parts of the Going To The Sun road. So we had to plan our attack differently. Instead of being able to drive through Glacier, we had to approach the innermost part of it from the west and from the east. We had decided to start with West Glacier and end with East, since we had to return to Billings after our trip for our flight home. The furthest in you could drive on the west side was the Avalanche Trailhead, one of the more popular spots in the park. I wish I had another Monday this month to show off Avalanche, because it was absolutely incredible. If you’d like to see some photos of it, click here. 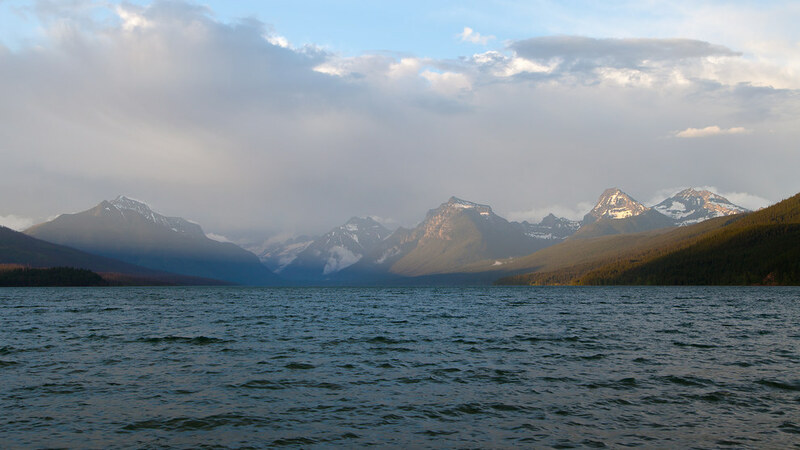 Lake McDonald is the first site you see when entering the west side of the park. It is a large lake that extends way into the park and one that you drive alongside for about 10 miles. At the end of the lake, on the right, is the pull off for Avalanche. After we hiked into Avalanche Lake we were headed back to the entrance of the park during a light rain. The weather was fairly dramatic, changing every ten minutes or so. It was sunny on our hike in, cloudy once we got to the lake, and then raining on us as we were getting back to the car. In this photo you can see the clouds from the storm which rolled through the mountains while we were hiking. It really made for a beautifully dramatic scene.